This lovely region, my adopted home, happens to have some totally awesome food--including regional stuff you can pick up at the supermarket. For a snack, I just had Joseph's whole wheat pita (Lawrence, MA) with very tasty Cedar's Artichoke and Spinach Hommus (Haverhill, MA) and washed it down with Polar Diet Birch Beer (Worcester, MA). 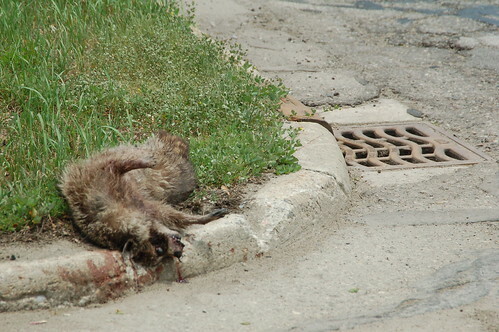 I spent a night in Ann Arbor, and all I got were these two bizarre photographs. My few loyal readers know that I am obsessed with two deeply american cooking traditions: barbecue (i.e. cooking with smoke) and making things buffalo-style. Since I don't have a smoker in my tiny apartment, I decided to create a serious buffalo chicken dinner. I admit that a lot of thought went into this. 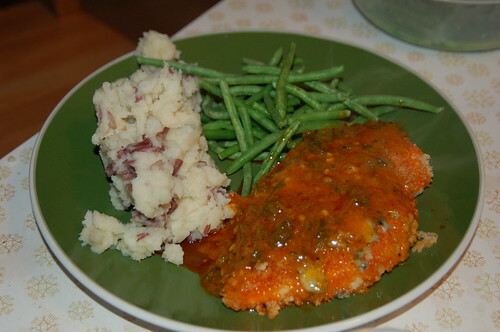 I recently perfected baked, breaded chicken parm, made with doctored breadcrumbs. 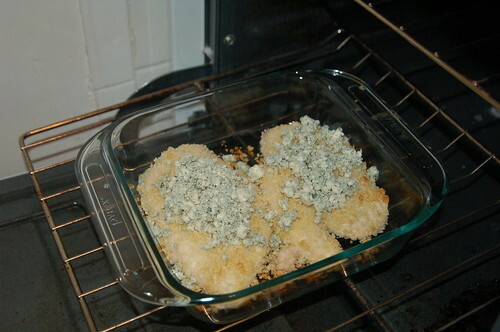 For the buffalo meal, I decided to go with panko breadcrumbs, which would absorb the sauce better. 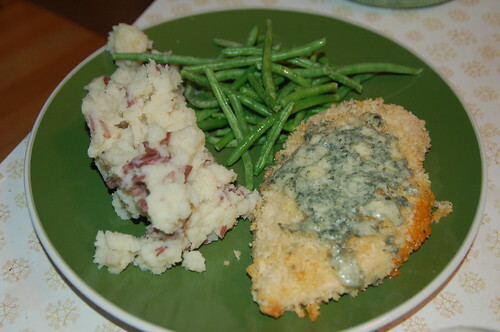 And the chicken breasts would get a topping of blue cheese before saucing (hence the parmigiana moniker). 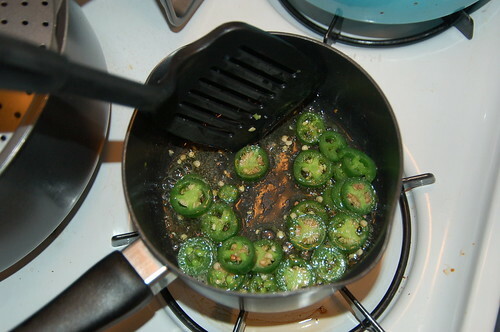 To improve upon my buffalo sauce recipe from college, I decided to start with a base of sauteed jalapenos. And what the hell, I'd microwave some green beans and make milky mashed potatoes while I was at it. 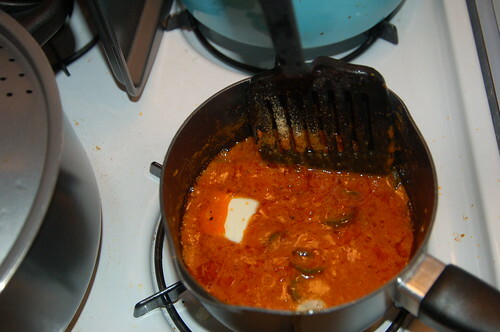 My place has smelled like buffalo sauce for two days, and I'm about to eat the leftovers. 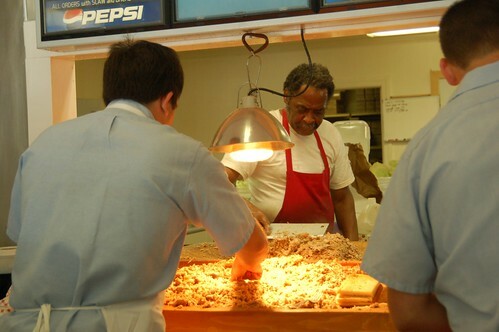 North Carolina barbecue is a complex tradition. For that reason, it's a good thing that nothing ever changes at the Skylight Inn. 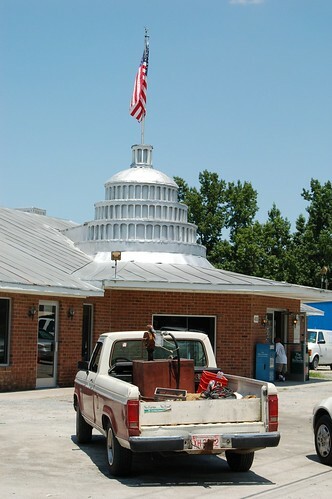 Hidden on a side road in the farm town of Ayden, the Skylight serves up whole hog barbecue in a way that no other commercial establishment I know of does. The place has been there for decades, but in our two visits, nearly two years apart, the only thing that changed was the uniforms on the employees. 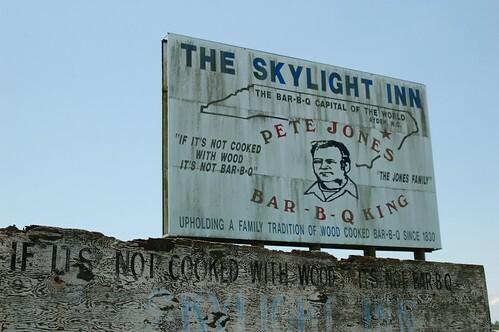 Anyone can read up on the Skylight: it was crowned the "barbecue capital of the world" by National Geographic in either 1979 or 1988, depending on your source, and since then, it's been featured in GQ and People. 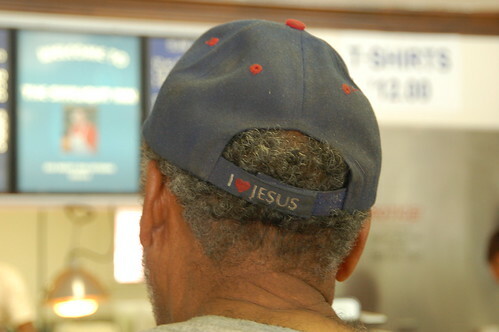 But the crowd is totally rural: decent, Christian-shirt-and-cap-wearing people of two varieties, white and black. 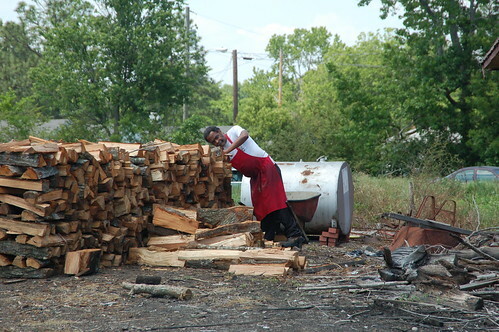 That said, race and class happen to be irrelevant in barbecue. And while the Skylight Inn's presence in the national consciousness is clearly the result of and evidence of the intelligentsia's visits to Ayden, I've never seen another out-of-towner there. 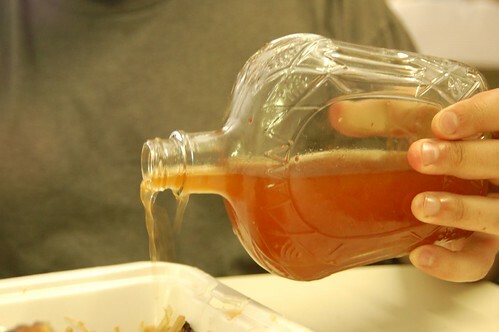 The Skylight Inn produces four things: whole hog barbecue, truly unique cornbread, a simple and sweet coleslaw, and requisite sweet tea. You can't buy anything else and the recipes never change. So what's so different about their food? Obviously, the barbecue is the centerpiece, and to an outsider, it conveys a sense of strangeness that can't be forotten. The Skylight Inn's pit boss, who has apparently worked there many years, cooks whole hogs over hickory coals for several hours, then hand-chops every usable piece of pig on a giant wooden cutting board adjacent to a similarly sized wooden trough. The cutting board is in the kitchen, and the trough is in the dining room. ...and blends and chops it all together with the rhythmic pulse of his cleaver. Chop chop chop chop chop. 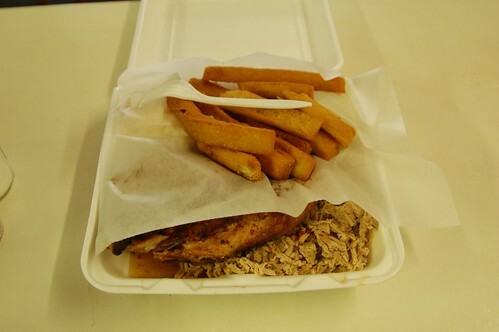 When the mix is consistent and perfect, the blade of the cook's cleaver pushes it from the cutting board to the trough, where front end employees load up paper trays of barbecue. 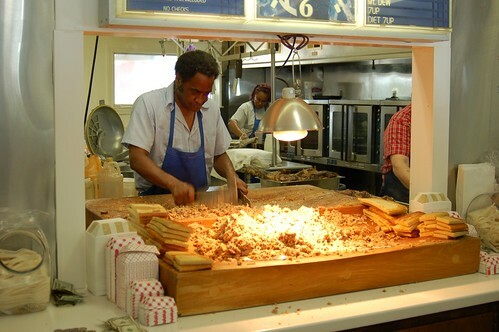 It is indeed the pigskin that gives the Skylight's barbecue its most oddly appealing attribute: the crunch factor. The first time I ate there (on NCBBQI, July 2006), I feared that I'd break a tooth on a bone fragment or piece of cartilage. But I soon learned that nothing unchewable goes into the Skylight's barbecue. 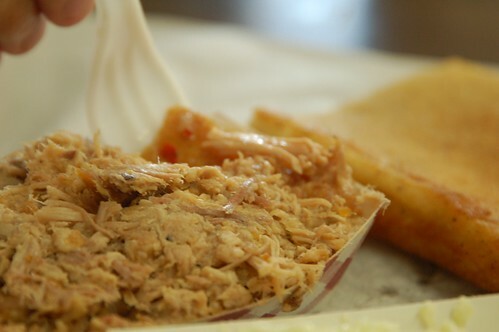 Smoked pigskin pushes back a bit on your teeth with a faint crunch, but it's nothing you can't handle. 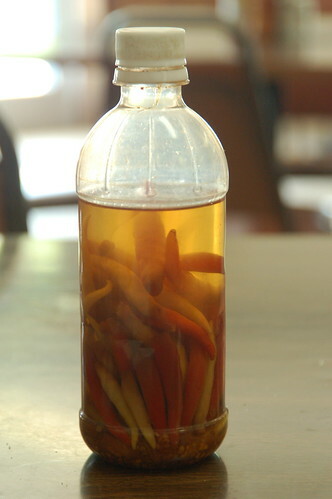 And the unique blend of meat and skin serves as an ideal sponge for the pickled pepper-laden cider vinegar found on every table in the dining room, not to mention the individual condiments that are mixed into the barbecue by the pit boss's blade. That leaves us to the sides. The Skylight's cornbread is strange and flat. I dare say it's almost flavorless, but the North Carolina Barbecue Society Website (and the book it quotes) claims that the very flat cornbread actually has "drippings" from smoked hogs mixed into the dough. I'll believe it when I see it: I like to have an everyman experience wherever I go, so I've never asked to tour the pits or the kitchen. The slaw is simple, green, and sweet. 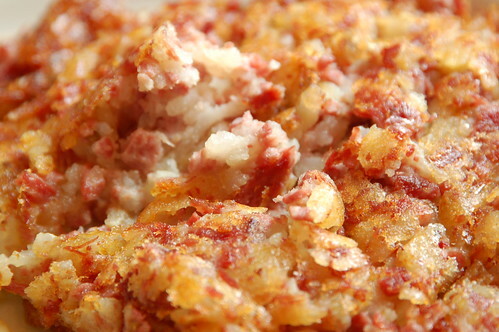 It's very finely chopped, and neither watery nor thick. It's a perfect accompaniment to the meat. ...bear silent witness to the traditions that are upheld at the Skylight Inn. Will the traditions continue? It seems that the pit boss, that frequent subject of my photographs, is truly the man whose craft and dedication keep the place going. Who will take over when he is gone? Who will get the coals going at 4am and babysit the smoking pigs for hours, then chop them up for hours more, then dispose of the burnt coals and select the firewood for tomorrow? 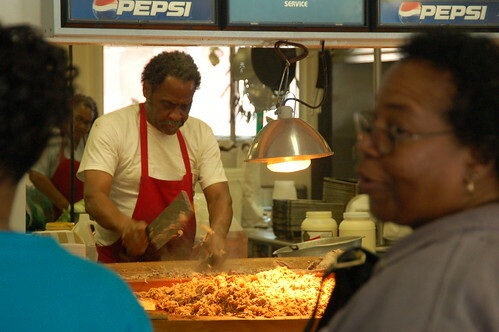 I'm glad to report that the Skylight, at least right now, is what it has been, and reminds in our minds the king of Eastern Style barbecue. Additional photos are available on Flickr, from visits in July 2006 and May 2008. 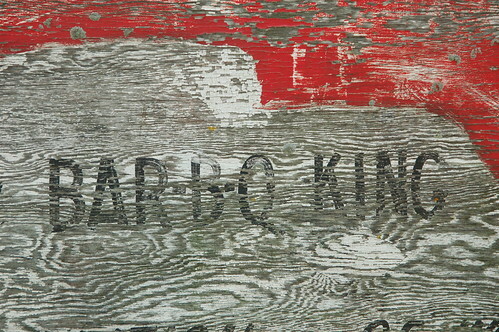 It has no phone line, but it has a state road named after it. 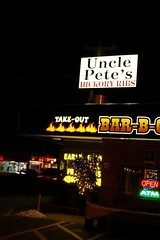 It only opens for lunch, and it closes as soon as the last scraps of smoked meat are sold. 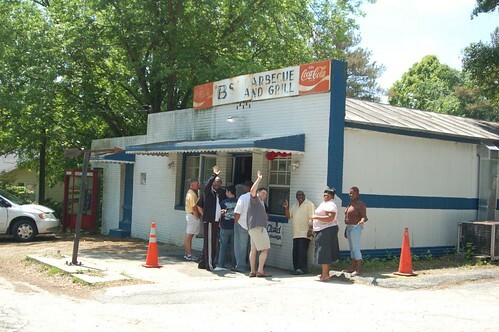 The anomalies and challenges surrounding B's Barbecue make it the grail of any barbecue quest, so we made it the first stop on our second North Carolina trip. Now, about those challenges. First, you have to work around B's summer vacation schedule. Impossible! They have no phone or website. 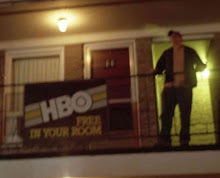 In 2006, we showed up late on a Saturday morning to find the place closed for a week. (Okay, it was close to July 4th.) Second, you have to get there before they run out of food. Greenville looks reachable on a map, but it's actually four and a half boring hours from D.C., where our NCBBQ tours begin. This time, we did the requisite planning. We had to wake up hung over on a vacation Friday at 6:30 a.m., grab bagels, and book it southward from the District. I-95 is heavily policed in all of Virginia, so one must drive the speed limit. 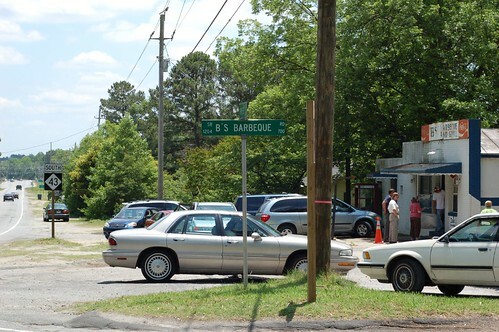 As the stereo in Rob L's Taurus blared blared Dale Watson and John Hiatt, the NC border grew closer and closer. 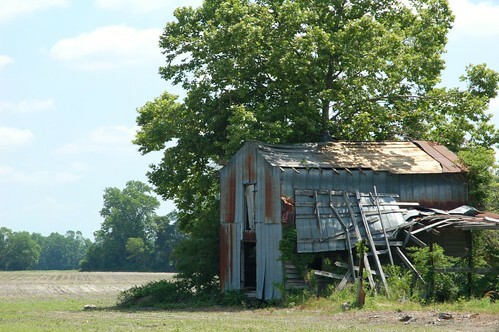 Traffic jams in DC and road work in VA slowed us down, and a nervous silence pervaded the cabin of the auto even as country and blues emanated from its speakers. Would we make it to Greenville in time? The gas needle moved leftward as our route took us over a very rural road. With eighteen miles to go, we were down to less than an eighth of a tank. Noon approached. Would we ever find a gas station between highways? If we ran out of fuel, could we hitchhike to the barbecue? I neurotically rolled up my window to reduce drag. Rob left his down. We drove on. 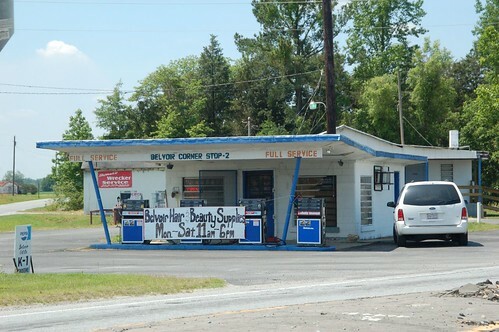 A rural outpost of three independent gas stations appeared; this was Belvoir, NC. One of the gas stations sold beauty supplies, and another was out of business. 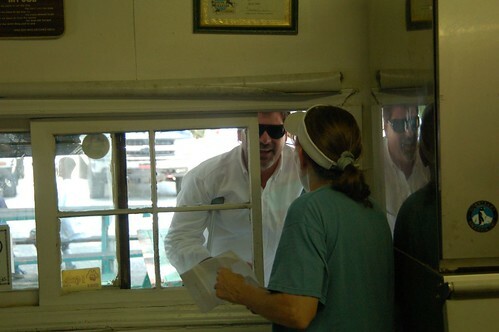 We gassed up at the third, where lunching farmers inside stared uncomfortably at our bright shirts. Quite the opposite of Texas, everyone wore baseball caps instead of Stetsons. Onward. Like many small southern cities, Greenville is ringed by rural suburbs and thick summer verdure. We knew we were close to B's, right around noontime, when the restaurant almost literally exploded into sight. At a T-shaped intersection stood the white brick structure and its smokehouse, the latter bellowing even whiter smoke into the clearing. Cars and trucks and every type of human covered every available inch of ground. There were many nurses and paramedics from the nearby hospital, schoolteachers, delivery drivers, a road crew, and us. We ditched the car and got on (in) one of the two lines. Friendly natives, visiting their former home from Dallas, welcomed us into the line. 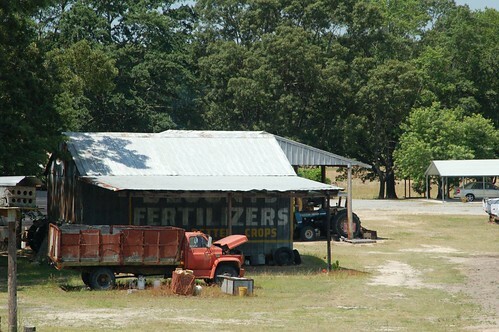 They told us that they'd come at 1:30 the day before and found the place deserted--the barbecue had run out. As we moved slowly into the building, we discovered that there was a quite large and dimly lit dining room inside. As the line made its way to the counter, we debated--again, neurotically--whether to get pork sandwiches or the chicken and pork combo. We were glad we chose the latter, for B's is the only place I've been to that gives its chicken and pork equal treatment. This means that instead of using a thick, tangy, tomato-based sauce on the chicken (like Stamey's in Greensboro does, for instance), B's douses its chicken with the same vinegar-based sauce or "dip" that the pork gets. Every joint in NC makes its own sauce, so it's hard to describe the faint variations, but B's is accentuated by bright flecks of a red pepper. But enough about the chicken. The pork, of course, was perfect. 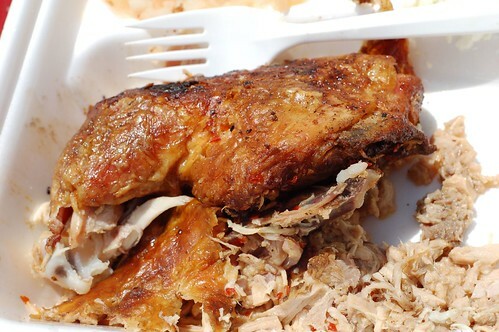 B's barbecue was tender and almost smooth, with nary a bit of skin or bone to interrupt its texture. Meals also come with two sides and corn sticks, a strange, fried cornmeal concoction. Like the more common hushpuppy, they seem designed to soak up vinegar-based sauces. For my sides, I got a boiled potato salad and coleslaw. We ate and ate and only got halfway through our meals. By one p.m., the crowd showed no signs of dissipating. 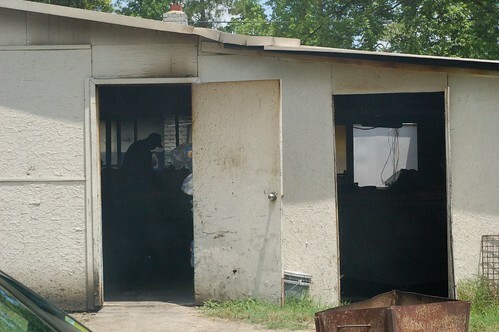 Smoke still bellowed from the smoker. Cars and delivery trucks hunted for parking spots, and some ended up parking in front of neighboring houses. 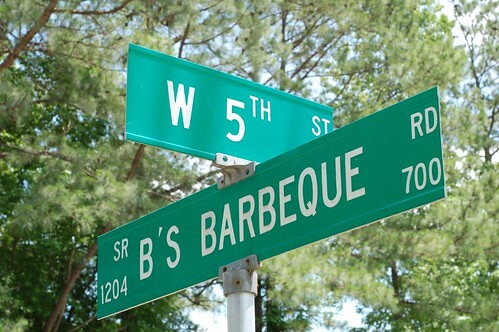 Yes, B's really has a state road named after it, though the road uses a different spelling of barbecue. Though sated, Rob and I had more work to do: we had to eat lunch again. 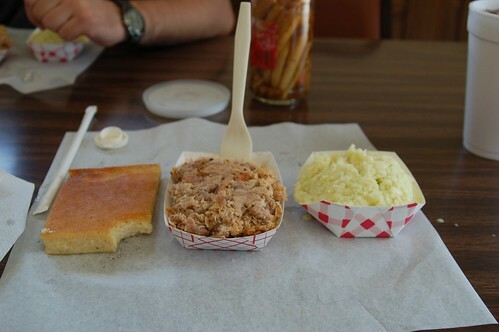 So we hopped in the car and drove down Route 43 to the Barbecue Capital of the World, the tiny town of Ayden, NC. That should leave room for one home-cooked meal.